Don’t you just love the summer? There are so many reasons why I do: sun, beaches, sandals, long days, warm nights, skirts, freckles and especially, most of all, the fruit. I try to eat plenty of fruit all year round, but in the summer it’s just so much easier and so much better. Peaches, nectarines, apricots, plums, figs, grapes, melon, and cherries, oh my! Oh, the cherries. I love all my summer fruits, of course, but I have a soft spot for cherries. Lately, the cherries at the markets here in Lisbon have been incredible, extra sweet and plump… the kind of cherries you just can’t stop eating and who cares if you get a stomachache? It’s worth it! After all, cherry season is far too short, so we have to take advantage of it while it’s here. I say the same thing every year, but every year the season ends and I wonder – did I really appreciate it enough? Did I show the cherries the love that they deserve? This year, make no mistake – I’m showing the cherries some love. I was actually planning to make a cherry pie, but a few weeks ago I saw a gorgeous berry galette on Smitten Kitchen and I immediately thought that it would be the perfect recipe to make with huge, extra-sweet cherries. I was right. 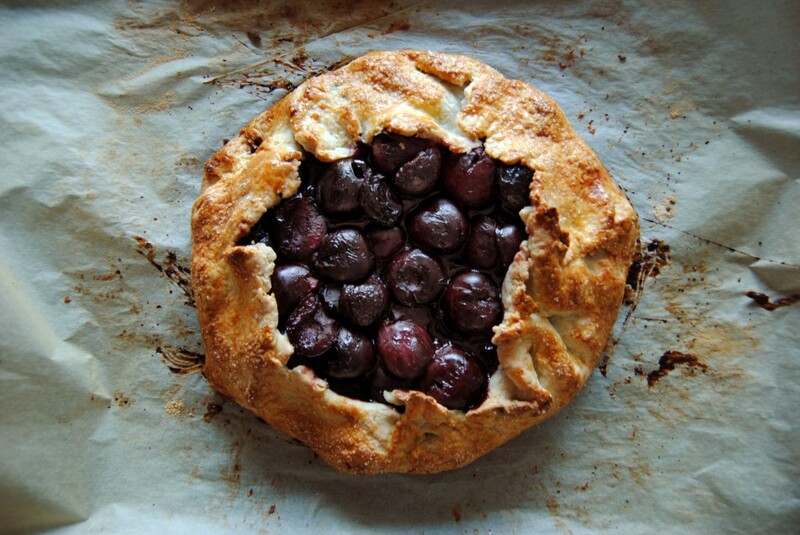 The crust is light but oh-so-tasty and the filling is just divine – the cherries are cooked just enough to really bring out the flavor while still holding their shape. If you try one recipe from this blog, try this one. In fact, try it twice, or three times, or a hundred times! It really is that good. What’s your favorite summer fruit? Any favorite recipes? I’d love to hear about them, and of course, let me know if you try this galette recipe and we can rave about it together. The only tricky part about this recipe is the fact that it requires pitted cherries. I don’t have a cherry pitter, so I had to improvise. I tried using a toothpick (fail), a knife (fail) and a skewer (double fail) before I finally found a gadget buried in the kitchen that I hoped would work. I think it’s a spout for an olive oil bottle? There’s a photo at the bottom of the page. Anyway, it worked perfectly. If you’re like me and don’t want to buy a cherry pitter, dig around in the kitchen and see what you can find. Be creative! Or, just cave and buy a cherry pitter. EDIT! A friend on the Chubby Soul Facebook page offered this helpful hint which might just be a game changer: “To pit a cherry without having to purchase a cherry pitter, you can place a cherry over the top of a beer bottle, then pierce it with a chopstick. Easy cleanup, too, because the cherry pits will be in the beer bottle.” Thanks Maritza! In a large bowl, mix together the flour, sugar, salt and lemon zest. Cut the butter into the flour using a pastry blender until the mixture looks like a coarse meal. Mix together ricotta and cold water in a small bowl and pour it into the flour mixture. Stir with a fork until the mixture starts to clump. Lightly knead the dough into a ball, wrap in plastic and press into a disc. Refrigerator for at least 30 minutes (but preferably an hour) before rolling. While you wait, mix together all the ingredients for the filling. Preheat the oven to 400ºF/ 200ºC. On a lightly floured surface, roll out the dough into a large circle, about 15 inches across. Place the dough on a baking sheet lined with parchment paper (hint – I rolled out the dough this directly onto the parchment paper that I used for baking). Pile the delicious cherry filling in the middle of the dough, leaving about a two-inch border. Fold the border over the filling, pinching here and there to keep it from collapsing. Don’t worry if it doesn’t look perfect – it will taste perfect! Bake for 30-40 minutes until crust is golden brown and/or until your whole house smells like cherries and you simply can’t wait another moment. Try to let it sit for a few minutes to cool before serving. Serve warm or room temperature, with vanilla ice cream (obviously) and perhaps with some warm, toasted almonds sprinkled on top. 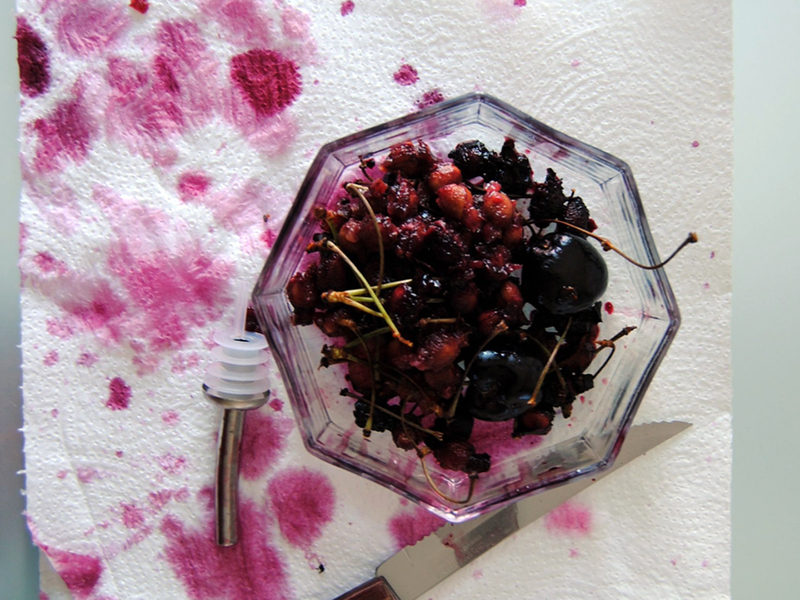 I’ll leave you with a photo of the bloody aftermath of pitting three cups of cherries. I hope it doesn’t give you nightmares. Check out my makeshift cherry pitter! P.S. Just as I was finishing this post, I came across this recipe from The Pioneer Woman. Ummmm, yes please – I’ll take ten! Guess I have a bit of galette fever. Your recipes and photos are beautiful! I will try to try some… looks like a level of complexity one step (haha… a few steps, lets be honest) above my usual culinary endeavors. BUT they are so enticing… I will try this one!